The Vinohrady health care campus started its development in the beginning of the 20th century, by then at the city periphery. In 1902, the Emperor Franz Joseph I inaugurated the Vinohrady Hospital as the primary hospital for citizens of Královské Vinohrady and Žižkov districts. In 1925 the State Health Institute was openin its vicinity. Both institutions soon started playing key roles in the development of health care in Prague, Bohemia and Czechoslovakia. Prior to the division of Faculty of Medicine in 1953, both insitutions served to training of medical students, based on systematic activity of their noteworthy staff. Of the Vinohrady Hospital, there were namely the Prof. of Ophthalmology Josef Janků, the discoverer of ophthalmic toxoplasmosis (M. Jankumi); Prof. of Lung and Abdominal Surgery Emerich Polák; the founder of Czech plastic surgery Prof. František Burian. After the WWII: the founder of Czechoslovak diabetology Prof. Jiří Syllaba, a famous cardiologist Prof. Vratislav Jonáš, the founder of Czech pediatric haematology Dr. Jiří Janele, Prof. of Neurology J. Šebek, Prof. of Forensic Medicine E. Knobloch or the Head of Psychiatric Institute doc. V. Petráň. Of the State Health Institute staff namely: Prof. Ivan Honl, who established the first therapeutic Pasteur Institute on the terrritory of our state. The staff of this Institute participated in numerous world-wide programmes of the World Health Organization after WWII, among others in global eradication of small-pox (Prof. Karel Raška). Based on such a rich tradition, it was feasible to establish a new medical faculty on the Vinohrady health care campus. Our Faculty refers to the tradition of medical studies at Charles University as it formed one of the four basic subjects upon its foundation in 1348. From the academic year 1882/83, the Faculty of Medicine, just as the rest of the University, was divided into two parts – German and Czech. On November 17th,1939, together with all other Czech schools, the Czech part of the University was closed. This temporary halt in Czech education lasted till 1945. Then, along with the whole of German University, the German Faculty of Medicine was abolished. Its property was handed over to the Czech Faculty of Medicine. In 1953 the Ministry of Higher Education divided the Faculty of Medicine in Prague into three separate faculties: the Faculty of General Medicine (including stomatology), the Faculty of Pediatrics, and the Faculty of Hygiene. The latter was transformed into the current 3rd Faculty of Medicine in 1990.The fact that a new independent Faculty of Hygiene was created in 1953 brought about some fundamental changes: this Faculty preserved a basic medical focus, although it specialized in the fields of hygiene and prevention. On the one hand this specialization enabled to develop all branches of hygiene in our post–war medicine, but on the other it at the same time restricted and limited the scope of students’ realization in clinical practice. The medical instruction at the communist era was branded by a rather formalistic and cadre based approach. Since November 1989 we have been able to carry out all substantial changes in the organization of the Faculty requisite for the realization of the new curriculum and study reforms. The name of the Faculty was changed to the 3rd Faculty of Medicine, Charles University, which underlined its primary general focus. Assoc. Prof. Cyril Höschl, MD, was the first Dean of the Faculty elected in the free elections after the revolution in 1989. The Academic Senate was established then along with the Scientific Council which nowadays enlists many outstanding foreign members. There were competitions for all the leading positions at particular Institutes, clinics, and for other university positions. The curriculum has been restructured so that the study plan reflects the general orientation of the Faculty integrating a developed area of preventive subjects. Plenty of employees from diverse sections of the Ministry of Health and the Academy of Sciences of the Czech Republic are directly involved in the pedagogic as well as research activities of the Faculty. In September 1992 a new Faculty building at Ruská street was opened. It houses the Dean’s Office, different theoretical Departments, Departments of hygiene and preventive subjects, and, last but not least, the Center for Scientific Information, newly established in 1992. In May 1991 Mrs. Margaret M. Bertrand, a Canadian professor of English language, founded a prize for the best student of the Faculty to be awarded annually at the graduation ceremony. The conditions for study and scientific work have improved with the opening of the newly constructed 6th floor of the main faculty building in May 2000, accommodating among others the Department of Nutrition and laboratories of chemistry and molecular biology. Further improvement has come in May 2006 with the recontructed part of the Nursing College on Ruská 91 where the Department of Medical Ethics, Nursing and Foreign Languages are now based. Students´ visits abroad are becoming an indelible part of instruction at the Faculty. Participation in international scientific and research programmes and lectures by foreign specialists enable the Faculty to spread its wings and establish new mutually beneficial scientific fellowships. This facilitates improvements in the quality of teaching material, studies of new methods, procedures, and approaches, thus creating technical conditions indispensable for achieving a higher level of education. The 3rd Faculty of Medicine conferred its teaching degrees to many outstanding personalities in the last three years, among the most prominent were: Prof. Zdeněk Neubauer in biology, Doc. Ivan M. Havel in artificial intelligence, and Prof. Luboslav Stárka in endocrinology. At the same time, several dozens of lectures by well–known foreign specialists took place on the precincts of the Faculty. Let us mention at least the Nobel Prize winner in neurophysiology Prof. J. Eccles, famous specialist in psychiatry Prof. P. Grof, and daseins-analytic Prof. Condrau. As proposed by the Scientific Council of Faculty, Sir Karl Raimund Popper (1902–1996), epistemologist, open society proponent, one of the greatest philosophers of the twentieth century, was awarded the degree of doctor honoris causa in medicine on 25 May 1994. The 3rd Faculty of Medicine was a party in awarding a honorary doctorate to one of the discoverers of DNA, Nobel Prize winner, Prof. James Watson. Likewise, on the occasion of the 650th anniversary of the Charles University foundation, we suggested that another Nobel Prize winner, a world–wide known neurophysiologist, Professor Huxley from Great Britain, be also awarded a honorary doctorate in 1998. MUDr. P. Čech of our Faculty initiated the placement of honorary plaques in memory of the Nobel Prize winners in Medicine Mr. and Mrs. Cori to their birthplace houses in Salmovska and Petrska streets in Prague within the project Prague–European City of Culture 2000. The co–operation among individual Faculties of the University, in particular Faculties of Medicine, is on the increase. The University supports healthy competition in sport activities among faculties, and students also take part in various social and cultural events not only in this country but abroad. The Faculty publishes VITA NOSTRA magazine, reflecting the academic life of the community and representing diverse sides of the Faculty in two functionally distinct issues: VITA NOSTRA REVUE, a quarterly collection of articles, commentaries, and reflections, and VITA NOSTRA SERVIS, an information bulletin which comes out on a weekly basis. In the academic year 1991/92 the Faculty took on foreign students in General Medicine with the Focus on Prevention. The language of instruction is English. The rights and duties of foreign students are stipulated in the contracts signed between the student and the Dean of the Faculty. New demands of modern medicine on doctors are reflected in the new curriculum of Medicine, which the Faculty has been implementing since the academic year 1996/97. The teaching basis of the 3. LF includes the Faculty Hospital Královské Vinohrady, Psychiatric Centre Praha, Hospital Na Bulovce, Thomayer Hospital, Institute for Mother and Child Care, Hospital Na Homolce, Central Military Hospital and The National Institute of Public Health. 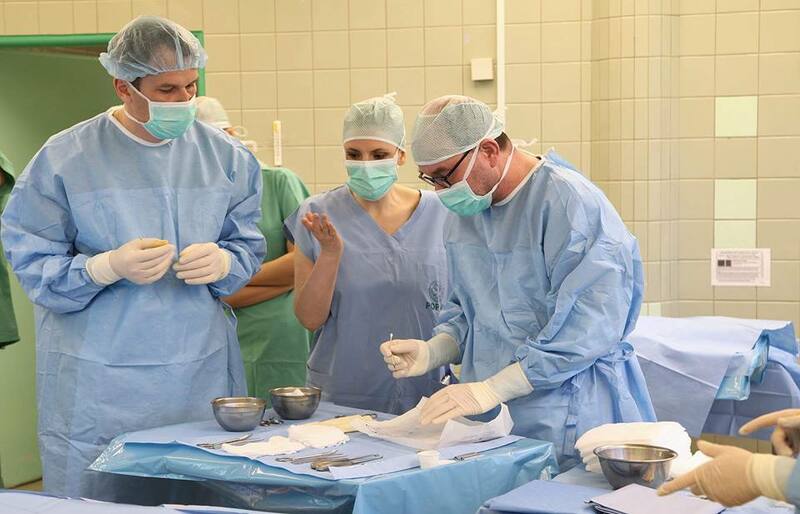 Prominent experts of the Czech Academy of Sciences and Institute of Clinical and Experimental Medicine also participate in the teaching.